Imagine you own a “thing” as part of your portfolio of “internet of things”. You can upgrade or change the function of the “thing” by loading a new app or other software onto the thing. You use a mobile app to control the thing. To can use the mobile app to instigate a process of injecting the new software into the thing. 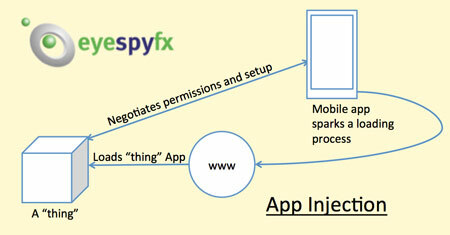 This is called App Injection. * The “thing” could be a car, a camera, a heating system, a network drive, etc. This entry was posted in Security, Viewer for AXIS Camera Companion, Viewer for AXIS Cams by admin. Bookmark the permalink.